There is so much to uncover when it comes down to the new 2019 Honda Pilot. As a family-oriented SUV, it’s designed to make everyone happy. Available in several colors to suit your interests, the Pilot is ready to provide you and your family with the on-road experience you deserve. Here at Manly Honda, we take pride in being a full-service dealership that offers both new and used cars for sale as well as a team of certified technicians that can service your vehicle with genuine parts. After we cover the 2019 Honda Pilot below, we invite you to make the short trip over to us from Rohnert Park and experience it for yourself! The powerful 2WD 6-speed automatic V-6 engine offers smooth acceleration and remarkable passing power. And with the available Honda-Linked Navigation System™, this SUV will support your travels with the family perfectly. Here at Manly Honda, we stock several stunning 2019 Pilot SUVs and our sales professionals are ready to help you get behind the wheel of one so that you and your family can experience its thrills first-hand. Drivers have increased safety when behind the wheel of the new 2019 Honda Pilot SUV. The rear bumper has sensors that detect nearby vehicles via the available Blind Spot Information System. This feature gives you some extra help in deciding if it’s safe to change lanes. Combine this feature with the Honda Sensing® safety suite that comes standard on every trim, and you’re in for a safe ride with plenty of peace of mind. Stop by our Honda dealership today to get a close feel on the innovative safety technologies of the new Honda Pilot. Ideal for a road trip with family or friends, the 2019 Honda Pilot SUV has the capacity to comfortably seat 8 passengers. As spacious as it comes, you can expect a comfortable, hassle-free riding experience. In this minivan, you’ll have access to the 3rd row of seats and if they aren’t being used, they can be folded down for additional cargo space. Whatever your travels require, you can bring it all along in the spacious 2019 Pilot SUV. The 8-inch touchscreen display boasts several capabilities and among these is your ability to connecting to your Apple or Android phone via Apple CarPlay® and Android Auto™. This feature allows you to play your favorite music, answer phone calls and navigate confidently from place to place while connected to your maps. And if you and your crew are in need of fresh air from the outdoors, you can take advantage of the available one-touch power moonroof that helps you get refreshed as well as take in exceptional views. 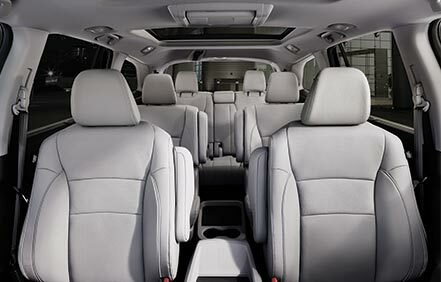 With this spacious, comfortable and innovative SUV, you and your entourage will not only arrive in style, but you’ll also enjoy the process of getting there. To feel and see the 2019 Pilot for yourself, head on over to our Honda dealership from Petaluma, CA and get ready to enjoy a spectacular test drive of this or any other new Honda we have for sale!